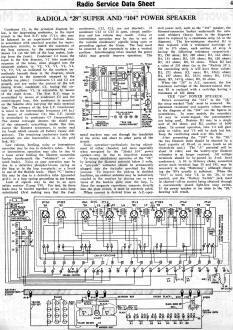 These schematics, tuning instructions, and other data are reproduced from my collection of vintage radio and electronics magazines. 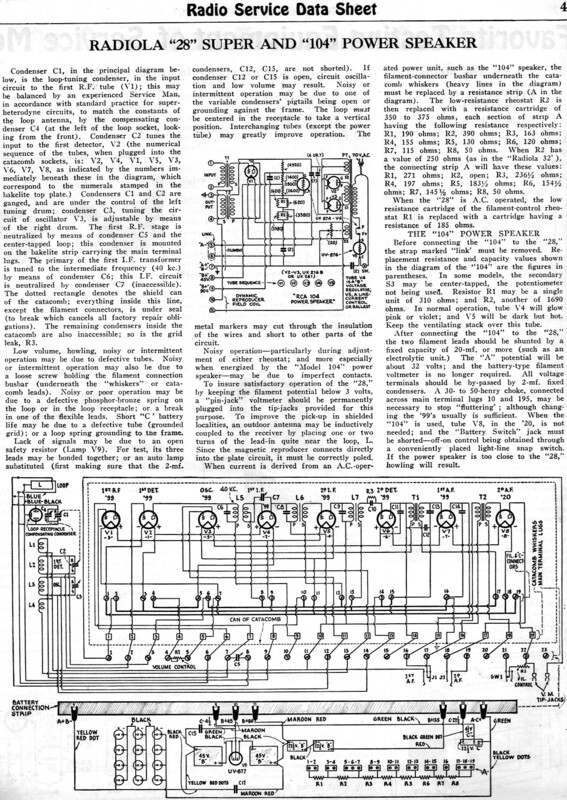 This particular Radio Service Data Sheet is for the Radiola "28," which is a very unique-looking radio set in the fashion of a small writing desk. 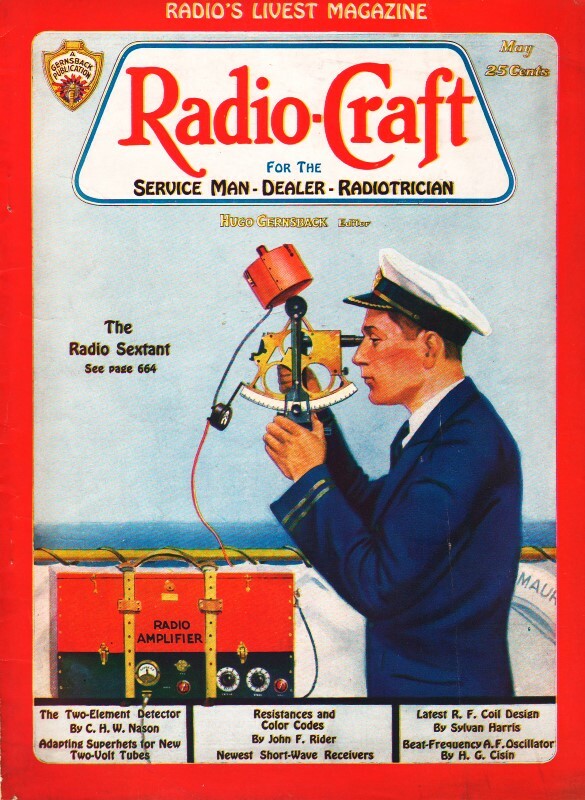 As back in the era, similar schematic and service info was available for purchase from sources such as SAMS Photofacts, but these printings were a no-cost bonus for readers. There are 187 Radio Service Data Sheets as of May 2, 2017. Condenser C1, in the principal diagram below, is the loop-tuning condenser, in the input circuit to the first R.F. tube (V1); this may be balanced by an experienced Service Man, in accordance with standard practice for super­heterodyne circuits, to match the constants of the loop antenna, by the compensating con­denser C4 (at the left of the loop socket, looking from the front). Condenser C2 tunes the input to the first detector, V2 (the numerical sequence of the tubes, when plugged into the catacomb sockets, is: V2, V4, V1, V5, V3, V6, V7, V8, as indicated by the numbers immediately beneath these in the diagram, which correspond to the numerals stamped in the bakelite top plate. Condensers C1 and C2 are ganged, and are under the control of the left tuning drum; condenser C3, tuning the circuit of oscillator V3, is adjustable by means of the right drum. The first R. F. stage is neutralized by means of condenser C5 and the center-tapped loop; this condenser is mounted on the bakelite strip carrying the main terminal lugs. The primary of the first I.F. transformer is tuned to the intermediate frequency (40 kc.) by means of condenser C6; this I. F. circuit is neutralized by condenser C7 (inaccessible). The dotted rectangle denotes the shield can of the catacomb; everything inside this line, except the filament connectors. is under seal (to break which cancels all factory repair obligations). The remaining condensers inside the catacomb are also inaccessible; so is the grid leak, R3.